Our favorite and most versatile frosting ever! 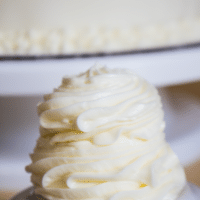 This vanilla buttercream frosting is so easy to make and perfect for spreading or piping onto your next cake or cupcakes! In a large mixing bowl (with a hand mixer) or the bowl of your stand mixer (with the whisk attachment), beat your slightly softened butter for 5-6 minutes or until light (pale in color) and creamy. Add the vanilla extract, salt (if desired, add to reduce the sweetness of your frosting) and 1 cup of the confectioners sugar. Mix at medium speed and add the remaining confectioners sugar alternating that with drizzling portions of the heavy whipping cream into the frosting. *You may not need all of the heavy whipping cream, stop adding liquid once you have added all of the confectioners sugar and have reached a firm, but spreadable frosting consistency. Once all of the confectioners sugar has been incorporated, continue whipping on medium speed for 2-3 minutes until light, creamy and fluffy. *Buttercream frosting stores at room temperature for 2-3 days once you have frosted your cake and does not need to be refrigerated, as long as your filling is not perishable (custard, whipped cream, or fruit fillings). **Store unused buttercream in an airtight container and keep refrigerated. Will store for up to 4 weeks. ***Before using refrigerated buttercream frosting, allow to come to room temperature.